Here's Angel our feral kitten that we fostered for a couple of weeks until she could eat solids on her own. My kids brought her home one day from the pet store where she was apparently dropped off. My kids are in fact anaphylactically allergic to cats yet cannot seem to stay away from them (KITTYCR*CK). At ~ 4 weeks old she was the size of a teacup. I've been busy and we just gave her back this week to be adopted hopefully at the store. In the beginning she had to be handfed softened food every 2 hours and had diarrhea. My kids and I gave her fish oil, probiotics (Flora Balance) and vitamin D supplements as well and as a result the diarrhea ended and she apparently grew like the carnivore that she is! When she first arrived, she walked with a wobbly gait and hopped on her hind legs like a d*ng bunny, but now at 8 weeks old she strides fast and long, like a predator ...bites like one too... then disappears into thin air. It is interesting how quickly carnivores are weaned from their mothers and adapt to solid and semi-solid foods compared to primates. Kennedy reports that 'Though humans have a longer period of infant dependency than other hominoids, human infants, in natural fertility societies, are weaned far earlier than any of the great apes: chimps and orangutans wean, on average, at about 5 and 7.7 years, respectively, while humans wean, on average, at about 2.5 years.' Why? Because we're predators, not bunnies. HunterAngel acts like a predator, day and night. She practices hunting, capturing and stalking her prey. Only predators are playful in the animal kingdom. Here is a picture, she leaped 12-18 inches to grab the camera flash! Other targets including our face, our feet and plump fingers! I have dozens of microscropic puncture wounds from her lovely feral baby claws. After her nails were clipped, it wasn't so painful playing with her. Naturally she practices HIIT -- bursts of hyperactivity and playful brutality with our body parts or her toys, then long, extended naps. She's young and sleeps all day. Unfortunately the pet store feeds the S.A.D. version of cat-kibble, but with us she was given something similar to the below Canadian brand and real food (raw yolks, meat, bone broth). Orijens: 'biologically appropriate' (grain-free) food for cats and dogs sourced from free-range meat or wild-caught seafood (80/20/0 = meat/vegfruit/grain). Somewhere in our hominid timeline, humans have regressed and are de-evolving -- our guts, our brains, our skeletal system, our fertility/gonads... See top. Like captured predators, zoo humans eat pre-digested and refined, mass manufactured 'food'. Where's our playfulness? Our carnivory lifestyles? The RAW?? On forums and digital savannahs??? Recently we moved from the cement suburbia into the cement jungle of the big city of Shanghai... A lot of adjustments but in some ways neat adventures for us. Purgare is Latin for 'to clean' (according to my handy dandy Latin dict) or to salvage or scavenge. [please correct me!] Are we as a species in the modern, tech age and interstate/intercountry commerce, more homo purgare than sapien sapien ('doubly wise')? Milton states that 'As human evolution progressed, young children in particular, with their rapidly expanding large brain and high metabolic and nutritional demands relative to adults would have benefited from volumetrically concentrated, high quality foods such as meat [and fat, I say]. 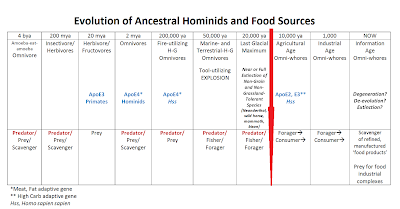 Today, many humans, particularly those in high income nations, have a variety of high quality, non-ASF [animal sourced food] dietary alternatives, but such foods were not generally available to paleolithic human ancestors nor to many people today in low income nations.' Yes. GMO soy products, formula, hydrized high-gluten wheat, GMO rice and refined packaged foods are not available in some third world countries but that is rapidly changing. Big Agra and Fast Food Nation have hit. India, China and Africa are besot with mass produced, manufactured foods now and it shows. Feedlot eggs, dairy, poultry and meat are commonplace as well. Fields of GMO rice and crops growing on vast landscapes (on industrial waste typically, like Pearl River). Obesity and T2DM are epidemic, especially in China where the rule is one child per family, leading to 3 sets of over-feeding influences (parents, 2 sets of grandparents). Predator of Prized Brain Nutrients Admittedly, Angel's never going to hunt except a few lost flies or mosquitoes, unless she escapes to the outdoors. We did let her scavenge at the dinner table with my kids alloparenting her with pre-chewed scraps (and human mouth flora!)... Going back to Kennedy... Competition with other carnivores (like Angel's predecessors like saber tooth tigers, leopards, etc) may have encouraged selection for earlier weaned humans and scaling the care-giving role from mother to extended family or pack members. What were the nutrients they were competing for? Kennedy argues that acquisition of protein (and thus fats) selected for brain survival and early weaning. Like carnivores, mother's milk wasn't enough to continue growing the predator brain. Like some carnivores, one, single mother alone wasn't enough and alloparenting evolved. Humans are mega-caregivers for long-lived offspring requiring intensive rearing, as well as mega-consumers of specific brain nutrients from protein sources: omega-3, minerals, amino acids, fats. It's a curious combination deeply forged in evolution. Eating tongue-to-testicle and muzzle-to-marrow are the only ways to source the required nutrients for optimal brain maturation and growth. For predators with big brains. "Assuming that living great apes demonstrate the ancestral weaning pattern, modern humans display a derived pattern that requires explanation, particularly since earlier weaning may result in significant hazards for a child. Clearly, if selection had favored the survival of the child, humans would wean later like other hominoids; selection, then, favored some trait other than the child's survival. It is argued here that our unique pattern of prolonged, early brain growth--the neurological basis for human intellectual ability--cannot be sustained much beyond one year by a human mother's milk alone, and thus early weaning, when accompanied by supplementation with more nutritious adult foods, is vital to the ontogeny of our larger brain, despite the associated dangers. Therefore, the child's intellectual development, rather than its survival, is the primary focus of selection. Consumption of more nutritious foods--derived from animal protein--increased by ca. 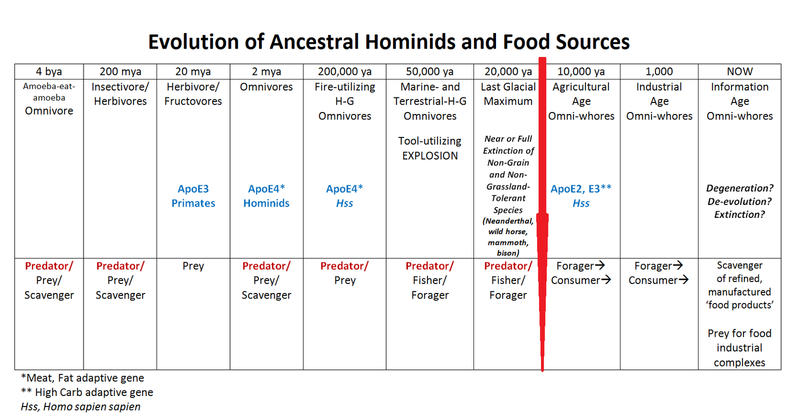 2.6 myr ago when a group of early hominins displayed two important behavioral shifts relative to ancestral forms: the recognition that a carcass represented a new and valuable food source-potentially larger than the usual hunted prey-and the use of stone tools to improve access to that food source. The shift in the hominin "prey image" to the carcass and the use of tools for butchery increased the amount of protein and calories available, irrespective of the local landscape. However, this shift brought hominins into competition with carnivores, increasing mortality among young adults and necessitating a number of social responses, such as alloparenting. The increased acquisition of meat ca. 2.6 Ma had significant effects on the later course of human evolution and may have initiated the origin of the genus Homo."